3D model repositories are online databases where members of the ever-growing community of 3D printing enthusiasts share their designs. You can simply browse the repository until you find a model which you like, download and print it. 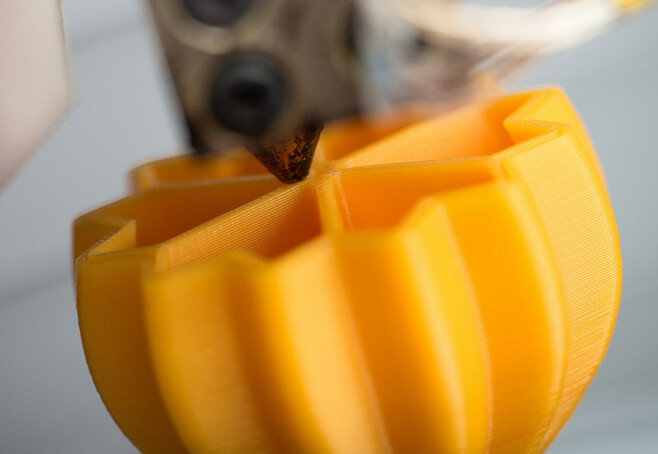 Let’s take a look at Thingiverse, the go-to place for 3D printing enthusiasts. 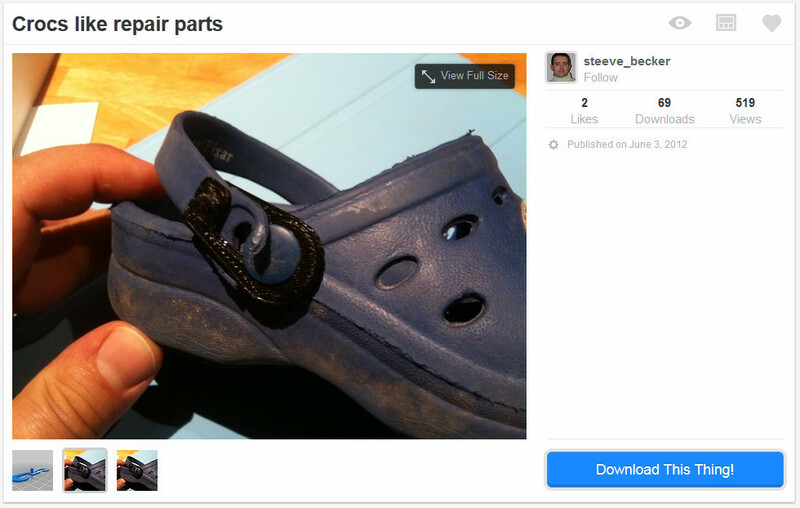 Many of the objects shared on Thingiverse are also for the purpose of repair. Next time you have a broken widget in your house, make sure to check Thingiverse, the design for printing your replacement part may already have been posted there. You can download models from Thingiverse even without having a Thingiverse account or being registered. However, in order to fully participate in the community, I’d recommend that you create an account which gives you access to all the sharing features. Also, as with most online communities, Thingverse is built on the concept of giving back. In other words, as a responsible community member, you should not only download models but also upload and share your creations to repay the community. A dashboard activity feed, where you’ll see the latest updates about the people and things you’re most interested in. Bookmark interesting models that you find while browsing the repository. Upload your own designs to share with the community. Post photos of models that you printed. Modify existing designs and share the new derivative design. Let’s take a look at the most commonly used features in the Thingiverse object view by the means of an example. 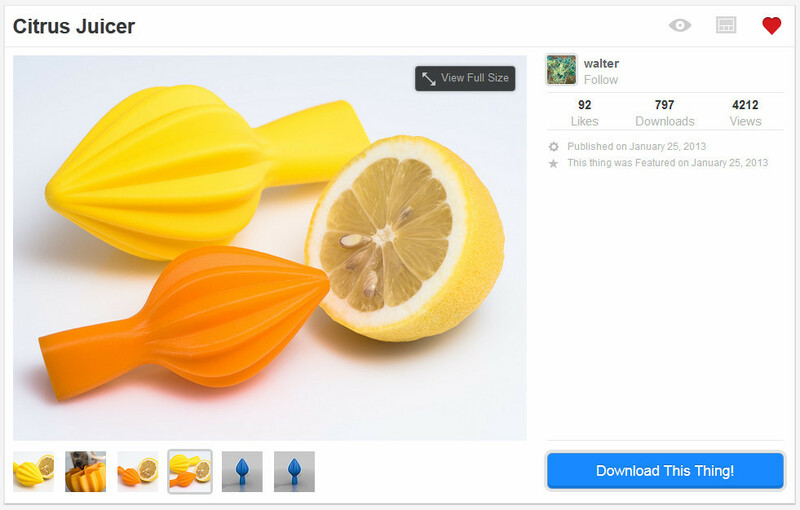 A citrus juicer posted the user Walter has caught my attention while browsing the “Household” category. 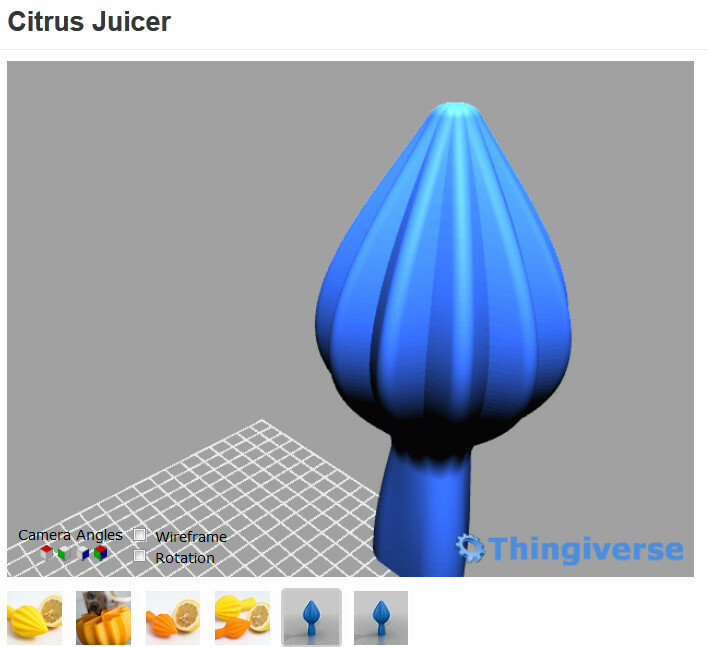 Below is the Thing page view that opens up once you click on the picture of the citrus juicer on the category page. 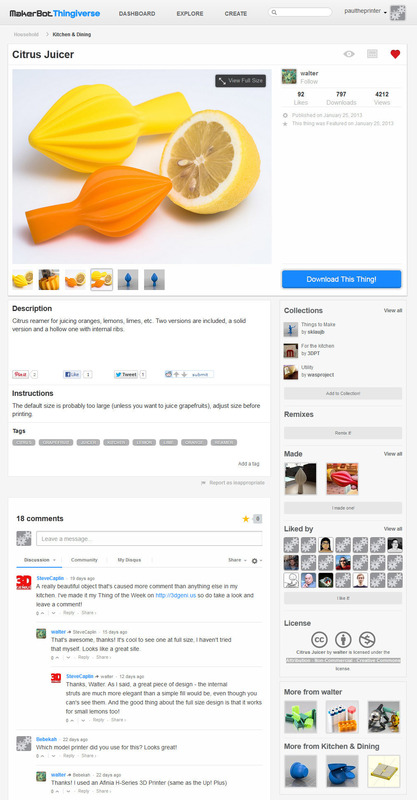 As Thingiverse is a social community you find many features such as social sharing buttons or comments which you are familiar with from other social networking sites along with some features specific to Thingiverse. Most prominent on any Thing page are the photos of the 3D printed thing along with the statistics of how many likes, downloads and views the model has received. The big blue “Download this Thing!” button opens the download window where you can chose in what file type you want to download the model. Thingiview: this is a neat feature that allows you to see the model in 3D without needing to download it. Just click on the “Thingiview” button in the upper right hand corner of the image for each 3D model. As Thingiview is an in-browser viewer, you can spin the model and look at it from all sides. Using the mouse wheel you can easily zoom in and out of a model. Additional features let you view the model in wireframe or you can look at the model using pre-defined camera angles. 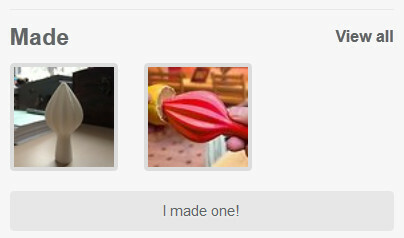 Made: the made tab shows pictures of users other than the originator who printed the citrus juicer. 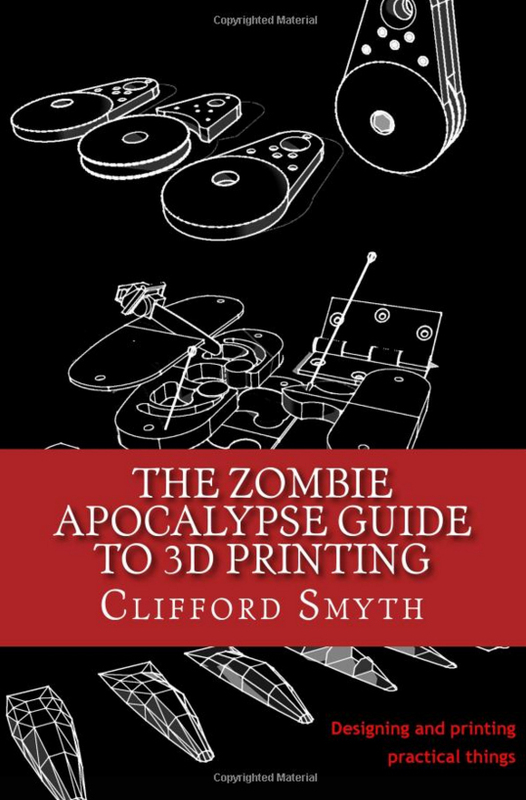 This can come in handy if you want to check how well a model prints before you set out printing it yourself. License: the license tab shows you under which license the model’s originator is ready to share his creation with the community. This is important information especially if you want to print or even modify the model yourself. In the case of the citrus juicer it is shares under a “Attribution – Non-Commercial – Creative Commons” license. A click on the link allows you to see what this means in plain English: you are free to share and remix the work but only for non-commercial purposes and only if you credit Walter (the originator) for his work. Although I already touched on the subject of Intellectual Property briefly above, you may be wondering what the general IP situation is for models that you download from online repositories. Generally speaking, all models are unique creations and therefore copyrighted by their authors. This means that you cannot simply use them for your own purposes. That being said, communities like Thingiverse rely on the multiplication effect that comes from people freely sharing their models. Therefore Thingiverse relies on Creative Common licenses as a way to manage IP rights. These licenses allow creators to communicate which rights they reserve, and which rights they waive for the benefit of recipients or other creators. An easy to understand one-page explanation of rights, with associated visual symbols, explains the specifics of each Creative Commons license. When downloading models online, always make sure that you have read and understood the legal disclaimers to avoid getting into any trouble. If you are seriously considering getting into 3D Printing then Thingiverse is one of those communities that you really should get involved in. 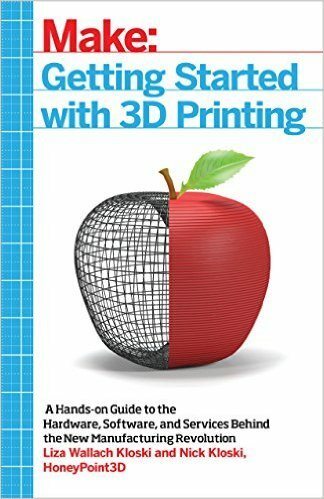 It has an almost endless repository of 3D models that you can use to test the limits of your printer. What’s even more interesting though is getting involved with the community: I am always amazed at the models some users create and get inspired just by browsing through the different categories. You can also learn a lot by following and interacting with some of the more advanced users. Best of all – the use of Thingiverse and the use of the 3D models is completely free! Note that there is a whole bunch of 3D model repositories available on the web. A lot of these offer free 3D models and on many sites you don’t even need to register in order to download any files. A full list of these repositories can be found on our resources page. However, the majority of files found in the different repositories are not .stl files which means that they are not ready to be sent to a 3D printer. The most common file formats are .3ds, .dxf and .max which all need to be translated to .stl files before you can process them with a 3D printer. Converting files into .stl files is not very difficult but it requires a few processing steps which I’ll cover in a separate post. What is your experience with 3D model repositories? Do you use them as a source for your 3D printing projects? Please share your comments, questions or experiences below.